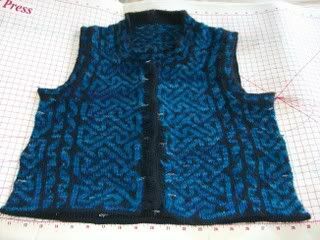 OK, the vest is done but for the buttons, which I will be attaching as soon as it finishes drying. They are pewter buttons shaped like trout – a little more ornate than what I’d usually put on them, which was why I went with just plain black button bands instead of the pattern. I don’t want them to get lost – they’re nicer than what I generally put on my projects. This was a sheer delight to knit. 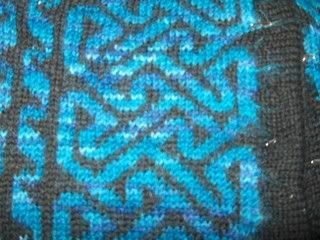 The pattern was not too challenging, but not boring either. It was knit in the round all the way up, with steek stitches (excellent article regarding these over here at See Eunny Knit, if you’re curious about how they work / why anyone would be crazy enough to use them / how come they aren’t nearly as scary as they sound). The one change I would make if I did it again would be to widen the steek stitches – Cheryl uses three, I think I’d use five. I know it uses more yarn, but I found it difficult to run four lines of machine stitches down that narrow a band. I accidentally cut through the machine stitching in a couple places (oops), but didn’t realize I’d done it until I was picking up stitches and the loose ends pulled up and created A Problem. FEH! Fortunately, the yarns I used are very old-style wool: They fuzz together and hold onto each other, so I don’t expect I will be punished any further for my misdeeds now that the cut edges have been covered with the facings and washed. Also, thanks to the wool being of this style, I had almost no ends to run in at all – whenever I needed to join in a new ball, I did the ‘splicing’ method (great explanation here in spit-splicing via Little Yarn Shoppe of Horrors), where you unravel each end, overlap the two unraveled ends, moisten (yes, I used spit) and rub like heck between your hands to twine them back together. If you spin, this makes perfect sense. If you don’t, you’re going “huh? !” and really ought to check out the link. The wool felts a little tiny bit with this mistreatment, and you then carry on knitting with it as though it was always one continuous strand. It works brilliantly on wool, and the ‘stickier’ the wool (e.g., more likely to felt) the better. Another interesting technique I haven't used much: Instead of casting off and then sewing up the facings, Oberle has you tack down the live stitches to the inside. I found it was easier to keep track of what needed to be tacked down where, and that the finished product was "stretchier" - none of that 'oops, now the armhole is pulling in' afterward. Nice! I'm going to remember this little trick for my Dale of Norway sweaters, which always-always-ALWAYS seem to end up with too-tight neck openings for the Denizens (entirely because I cast off too tightly and then tack down with a vengeance). I didn’t find any other surprises in the pattern; I did my usual thing when instructed to “pick up X stitches” along the button bands, neckline and armband: I worried more about picking up evenly than “X stitches” and adjusted on the second round – but the only adjustments I had to make was to remove one stitch on one armband, and add two on the other! That, friends, is a bulls eye. The Dancing skein was more than generous enough to finish the project – I have quite a little bit left over. I’ve really loved this color. The finished vest has a lovely ‘wash’ to it, with a lot of depths and shallows throughout. Your vest is so gorgeous. Great work!